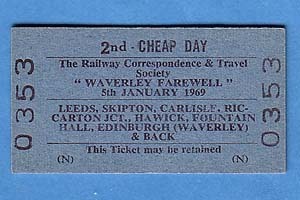 (1) This train provided one last chance to take a run over the Waverley Route, which closed the following day. 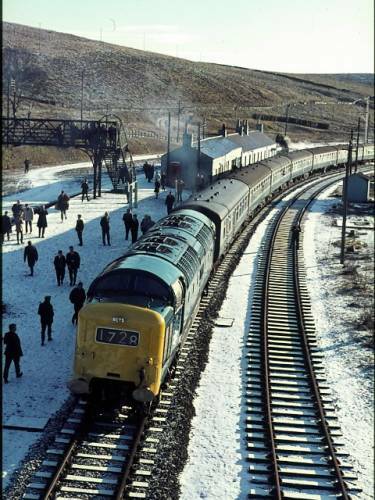 The train comprised of nine vehicles including restaurant & buffet car, and was handled with ease throughout by the Deltic. During parts of the trip heavy snow was encountered, but never enough to hinder the progress of the special. Train was re-timed to depart at 09:43 due to waiting for the Manchester connection. From Andrew Fairholm's ticket collection. The same day the last scheduled train over the route the 1M82 21.55 Edinburgh - St. Pancras, with eight coaches and two sleepers was handled by Class 45, 60 'Lytham St Anne's'. 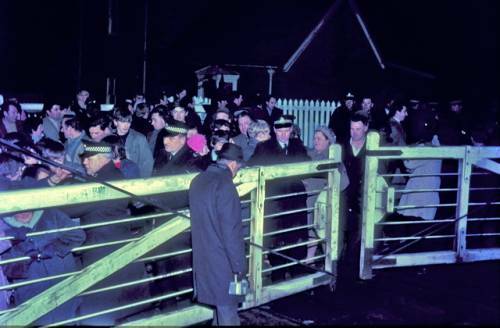 Departure from Hawick was not until about 00.15 (6th January) and Carlisle was reached over two hours late, caused by the boisterous activities of many local people protesting the closure of the route. 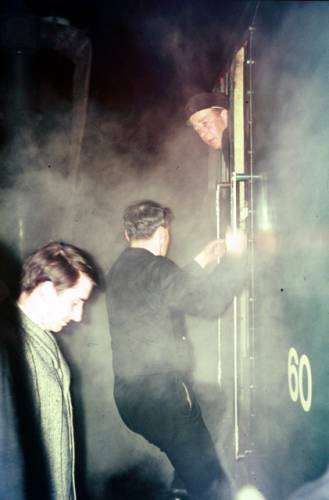 Due to the protests of the villagers at Newcastleton the Hawick pilot, 8606, was sent ahead light engine to ensure the integrity of the line south of Hawick. A light snow fall had taken place during the day, but the evening saw clearing allowing the sun to set one last time on this run and providing the protesters with a chilly night out. 0.00 Leeds City 09.30d 09.43 20.48a ? 0.75 Wortley Jn 09/33 ? 20/45 ? 10.56 Shipley Leeds Jn 09/43 ? 20/36 ? 16.79 Keighley 09/53 10/07 20/27 ? 25.00 Snaygill 10/03 ? 20/19 ? 36.15 Hellifield 10/19 10/28 20/02 ? 53.35 Blea Moor 10/46½ 10/48 19/45 ? 112.08 Petteril Bridge Jn 11/38½ ? 18/37½ ? 113.59 Carlisle No.3 11/44½ 11/53 18/29 ? 127.03 Riddings Jn 12/04 12/19 18/11 ? 188.50 Fountainhall 14.05a ~ 14.15d 14.03 ~ 14.13 ? ? 202.74 Hardengreen Jn 14/37 14/35 16/14 ? 204.76 Millerhill 14/41 ? 16/10 ?